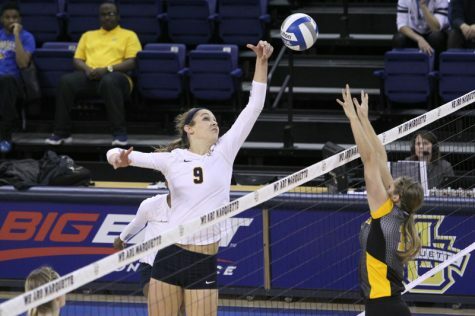 Outside hitters are the prime time players of volleyball. They are the Kobes and LeBrons of the sport, who are given the ball whenever the play breaks down or when a clutch score is needed. 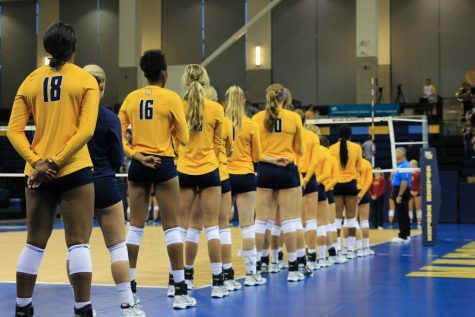 It’s no wonder a team’s fate often relies on the play of its outside hitters. When they are on their game, it will be tough to stop that team. 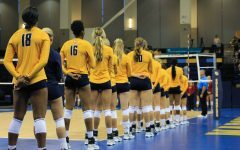 The Marquette women’s volleyball team received some great play Sunday from its outside hitters, sophomores Ashley Beyer and Ciara Jones, on the way to a three-set victory over Villanova in its final Big East match of the season. Beyer led the team with 17 kills and was a one-woman wrecking crew in the first set, tallying nine kills. 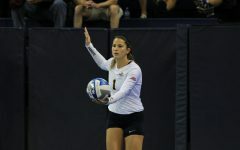 Even more impressive was the fact that Beyer recorded seven kills in her first seven attempts. 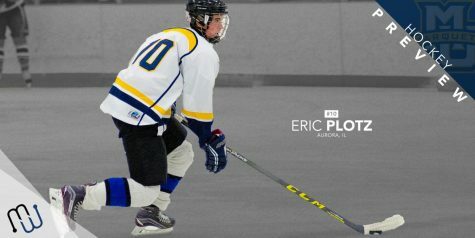 In a sport where recording three kills in 10 attempts is considered great, going seven for seven is almost unheard of. 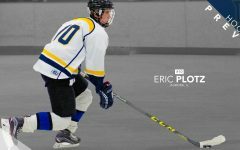 It can be compared to hitting four homers in a baseball game or going 10 of 10 from the three-point stripe in basketball. Beyer’s feat set a tone for the match and gave the Golden Eagles confidence in their hitting game. It also made her a target of Villanova’s blocking. The Wildcats put two or three defenders on her every time. 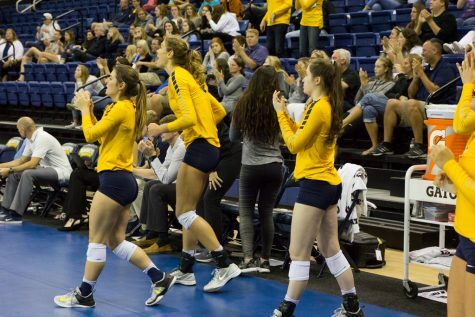 This gave Marquette more room to hit in the middle of the court, where junior Rabbecka Gonyo and freshman Kelsey Mattai punished the Wildcats for 15 kills combined. It was Jones, however, who would shine the brightest when the spotlight was on. 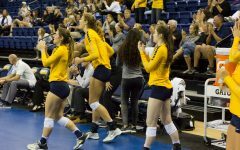 Her four kills in the final stretch of the third set propelled Marquette to a come-from-behind victory. With the game winding down, the ball was put in her hands. 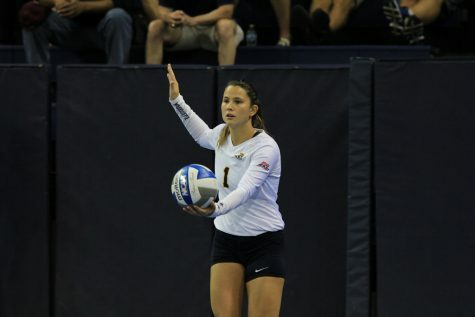 This is when outside hitters are needed most and Jones responded by dominating with four punishing kills. 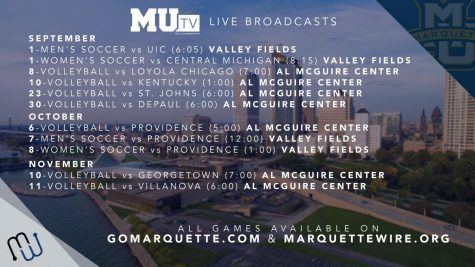 The victory was not enough to put Marquette into the Big East tournament. 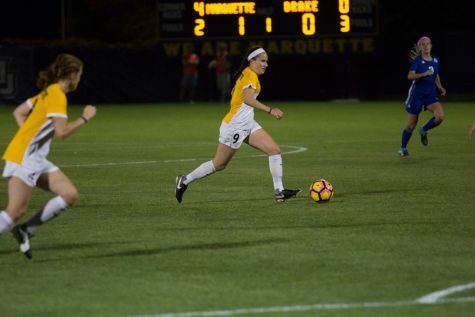 Finishing in a tie for eighth at 6-8 with West Virginia and Seton Hall, Marquette lost the tiebreaker, having lost to both of those teams earlier in the year. 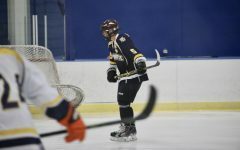 The Golden Eagles were still able to play with emotion and intensity, an attribute freshman Danielle Carlson said will be key in the coming seasons.